I am thrilled to have celebrated my 10th year as coordinator of the Grandview Woodland Food Connection, having started in the summer of 2007. 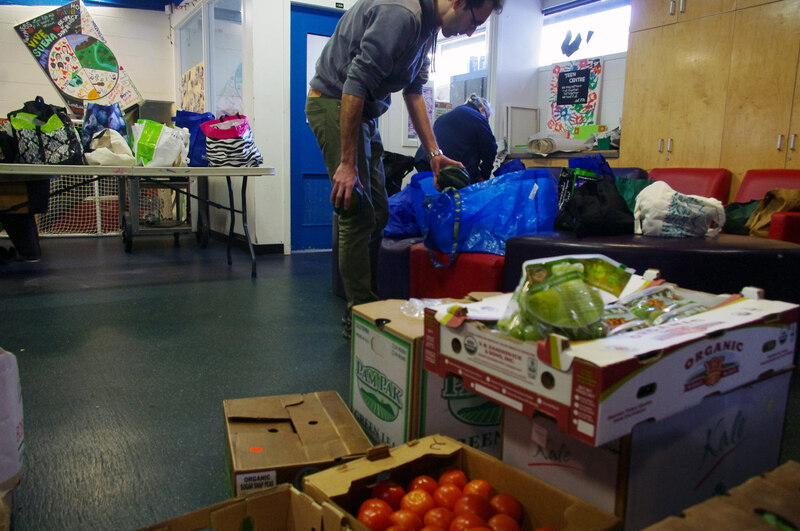 I am also very proud to have seen the GWFC grow into a strong and stable organization, providing a range of innovative food programming through Britannia Community Centre over the past decade. Together with Britannia, we are recognized as leaders in the community food sector meeting a wide range of community needs particularly focusing on households who are struggling to put healthy and affordable food on the table. As we look ahead to 2018 and with the Britannia Renewal on the near horizon (see below), we are very excited by the new possibilities to grow the GWFC significantly. Stay tuned to exciting new developments in the year ahead. 110 community members joined us Oct 10th in this sharing of food, community connections, and celebration of the Jewish Sukkot Holiday. Sukkot expresses universal themes of harvest celebration, cultural identity, human vulnerability, and community. We were privileged to receive a welcome and blessing ceremony from Senaqwila Wyss of the Squamish Nation, whose lands we have come to occupy and live on followed by a Sukkot blessings from Rabbi Hannah Dresner, An amazing dinner was then served up by Tayybeh, a Syrian social enterprise catering business that is supporting a group of recent Syrian immigrants to Vancouver. Wonderful conversations ensued, signing, and sharing a wonderful dinner made for a beautiful event. 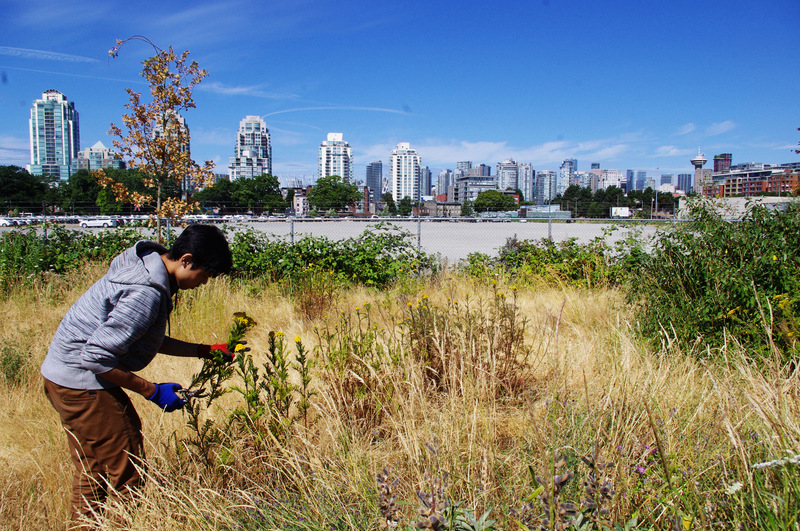 Wild Minds brought together a group of 12 youth for a summer gardening and ecology program where they had the opportunity to visit various gardens and natural areas and helped to re-wild a beautiful community garden space in Strathcona and Cottonwood Community Gardens transforming then into a more diverse ecosystems. 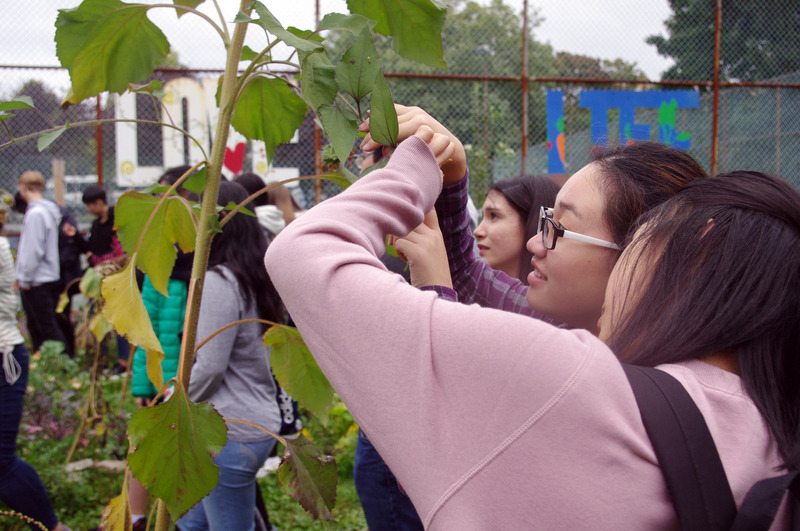 In the process, youth experienced a deep connection to nature and, gained new skills and knowledge about food growing, ecology, healthy eating, and environmental leadership. Over the 9 sessions that the youth participated, they learned about bees and pollinators, native plants and soils, seedsaving, composting and mulching, permaculture practice, natural dyes, and plant clothing, animal habitat, food growing and garden maintenance, urban farming, herbs and medicinals, and fruit growing, to name a few. 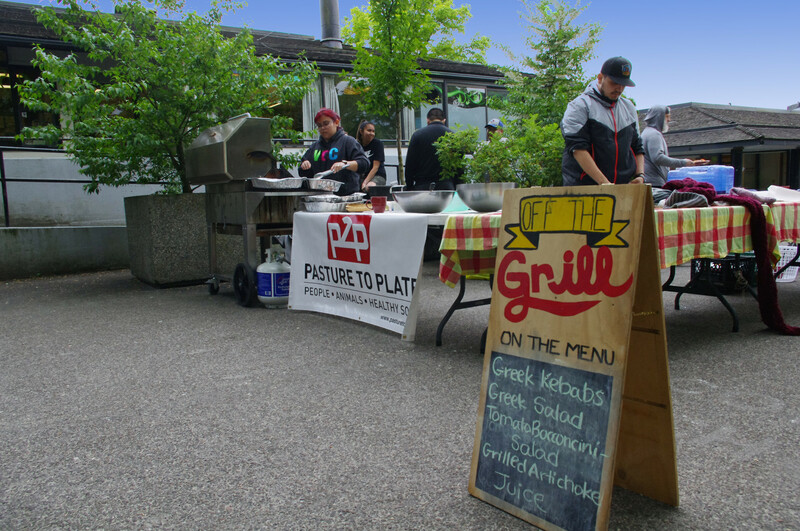 Now in its 5th year, Off the Grill is a community meal program with a difference. With its focus on supporting youth well being and healthy food access, OTG is working to create positive connections between youth and other community members in the main outdoor Britannia plaza where many of the youth like to hang out. 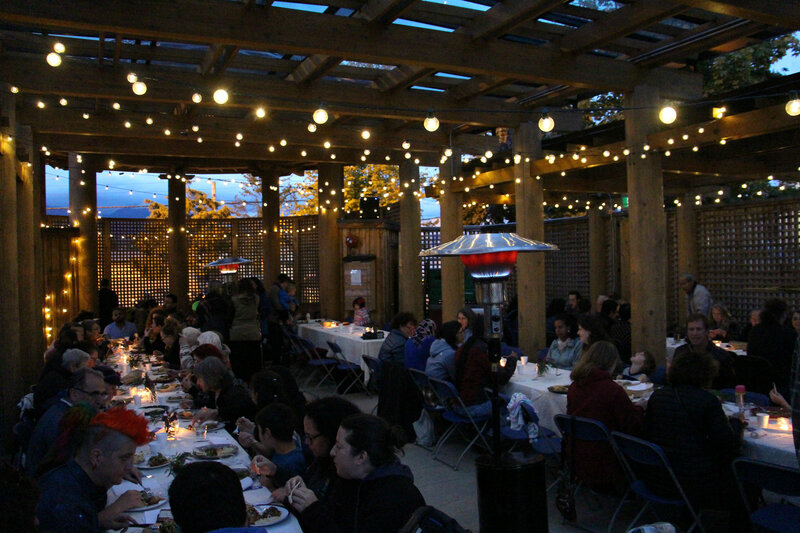 Twice a week during the warm weather months, the plaza area becomes a hive of community connection around a communal dinner prepared by youth under the mentorship of a professional chef. 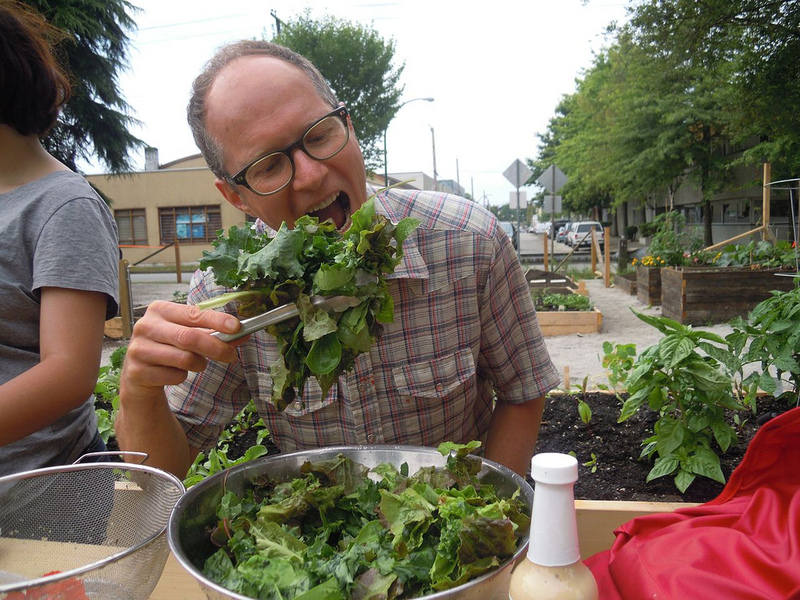 OTG’s goals include youth food skills building, health promotion through nutritious food preparation, and community building and social inclusion through food sharing. Big thank you to Pasture 2 Plate for their organic grass fed meat donations. 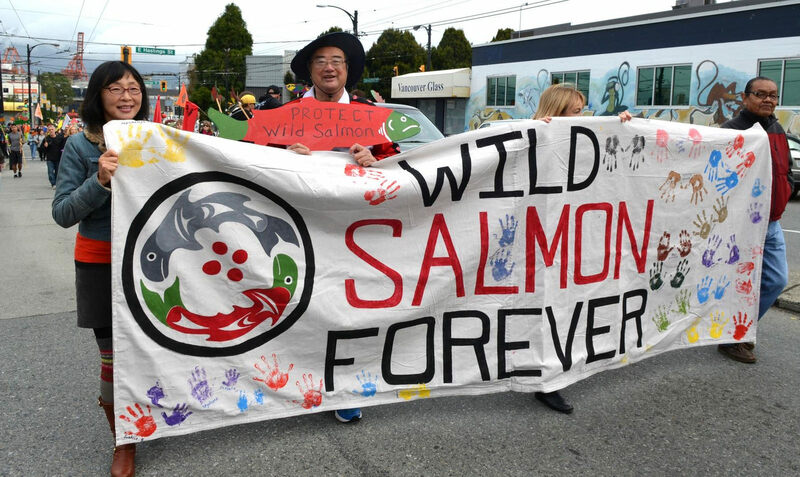 Another spectacular Wild Salmon Caravan Mardi Gras style parade with drumming, regalia, costumes, floats, signs, banners and more, which all express in celebration our love for and deep concern to protect Wild Salmon. Led by the Salish Matriarchs, the parade started at the Native Friendship Centre and walked up Commercial Drive to Trout lake where a salmon ceremony was held at the lake then followed by an amazing salmon feast, speakers, and performances. The GWFC is honored to help organize this event, recognizing that salmon are a critical food justice issue, in particular, for its importance to Indigenous people and a whole host of other species that depend on salmon for their survival. Britannia Community Centre where the Grandview Woodland Food Connection is located will be renewed in the next few years, which means a new community centre. The GWFC has been front and centre in the Renewal planning advocating for new and improved food infrastructure as part of the new development. This includes a substantially larger and functional commercial kitchen, dinning halls, more food storage, greenhouse, and food growing areas. 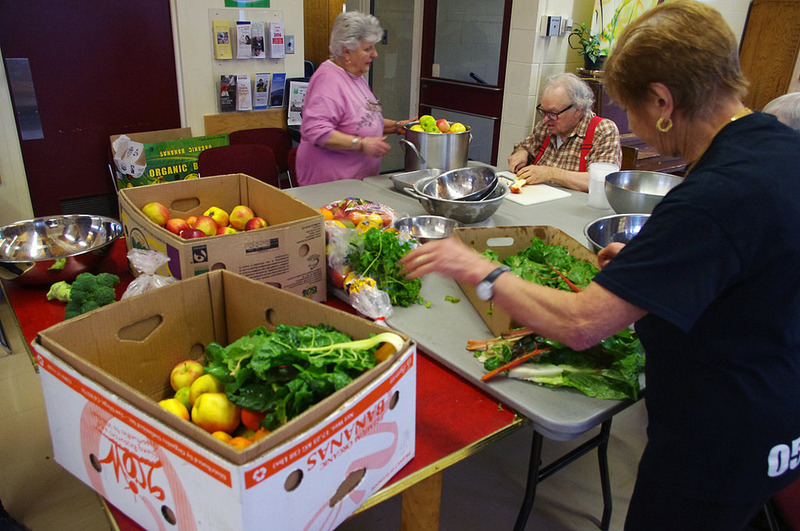 Good news is the community is overwhelmingly supportive, recognizing that food plays a central role at Britannia and is important to all programming. It is like the heart of the centre and for all practical purposes we hope to see a centrally built food hub accessible and adjacent to main event space, and program spaces including the seniors, childcare, and youth spaces that make use of kitchen spaces regularly. A final Master Plan is expected early in the new year. We also prepared 6 community meals serving over 370 people as part of the public consultations. Food recovery, also known as food rescue is an important issue these days as we come to understand the enormous waste in our food system whether the waste is in production, shipping, retail and distribution, or even in our own fridges. The World Food Organization estimates that around 1/3 of all food produced globally is wasted, which is enough to feed billions. As part of our effort to recover some of this waste, we have been collecting quality, mostly organic food from Choices Food Market and most recently, from Discovery Organics. This includes produce that may have some cosmetic damage or packaged food near or just past the best before date. While there is concern that we are reproducing a two tier food access system, we need to ensure that the food is of a high quality. We also believe that much of food rescue should not be seen as food only fit of those in need, but which is quality food that all of us should be eating in our effort to reduce food waste. Last year we collected over 10,000 lbs of food recovery, which was used in various meal programs and distributed through our Bulk Buy program. Had a great Volunteer Workparty and social with 18 of Britannia’s wonderful volunteers this summer who came out to the Nexway̓s wa lh7áy̓nexw (Transformed Life) School Garden at Britannia. We got alot of work done and had a delicious bbq dinner complete with fiddle music. We would like to turn this into a yearly event as it was very popular. Our Bulk Buy program continues to grow with 75 households now participating in the program from a range of backgrounds including many who are working but feeling financially pinched, seniors on pensions, folks on disability and income assistance and others. 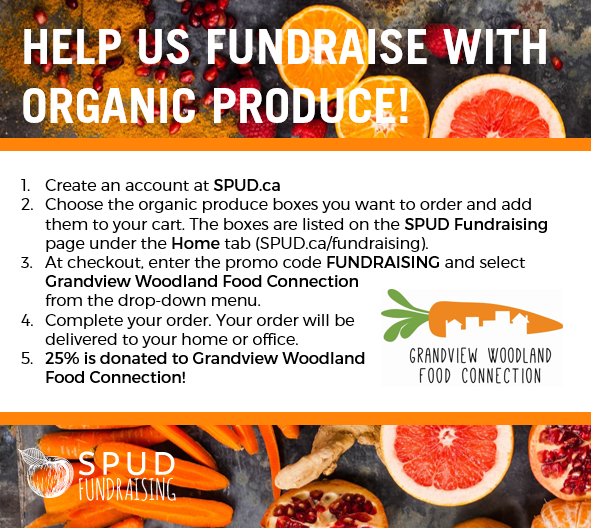 The program costs $14 to purchase wholesale produce from Freshpoint Foods which saved participants roughly 40% or a total of $2,800 over retail costs in 2017.. This past year we conducted our fist full evaluation of the program and hope to release the full findings soon, but we can report that 94% of participants reported eating more fruits and vegetables since joining in the program. 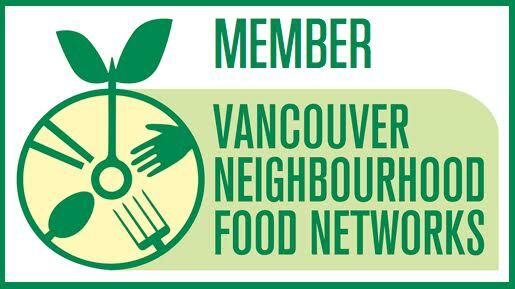 In addition this year, we have been able to add more donated and free food, including organic rescue from Choices and Discovery Organics, a new newsletter, and starting this next year new food skills workshops for Bulk Buy participants. Another wonderful year in the Britannia school gardens working with several Britannia classes every few weeks through the school year. School gardening continues to be our main focus. 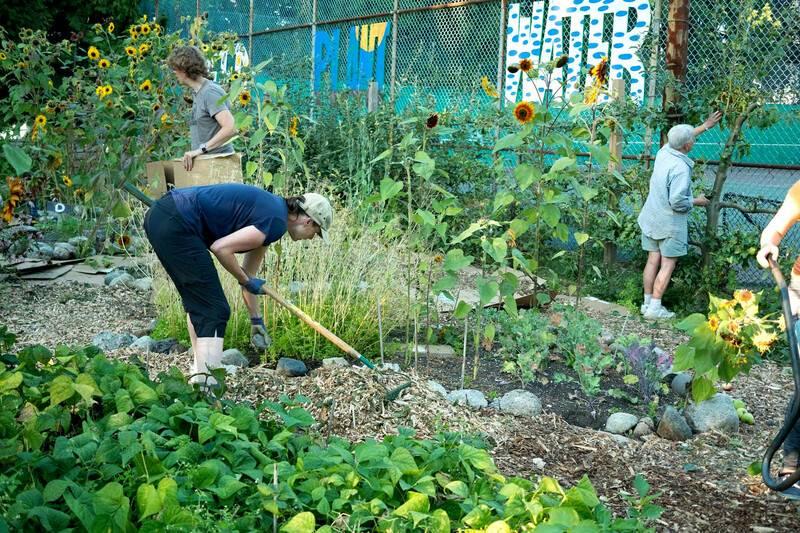 Working with youth has always made alot of sense, cliche aside, youth are the future and school gardening provides a very tangible, accessible,and practical way to teach youth about healthy eating and environmental leadership. 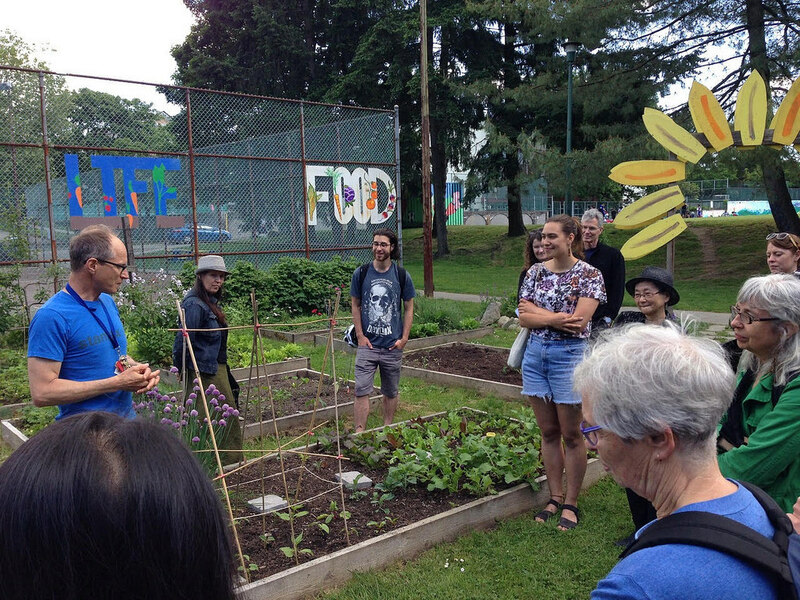 This past year we partnered with the Society Promoting Environmental Conservation (SPEC) who led several interesting workshops of seed saving, composting, soils, and other gardening topics. We also worked closely with Metis herbalist Lori Snyder who taught us alot about native plant foods and medicines and how to cultivate them for our health. Was also great to deepen our integration of classroom curriculum and the garden, connecting students to topics including fungus and mosses, invertebrates, soil biology, and plant evolution.